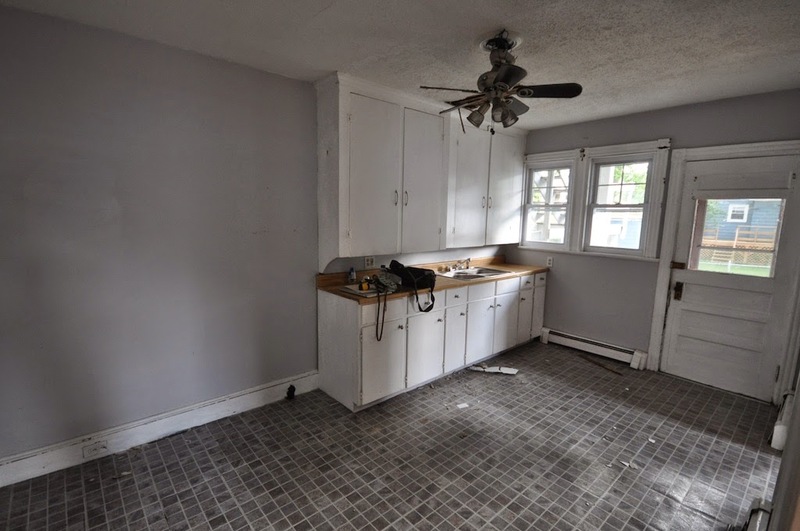 I can't quite decide what my least favorite element of this original kitchen was: the popcorn ceiling, the vinyl tiles, the lack of storage space, the sagging floors, or the fact that it was accessed through a dark hallway? It was hard to decide. But since we gutted the space, it really didn't matter that much. 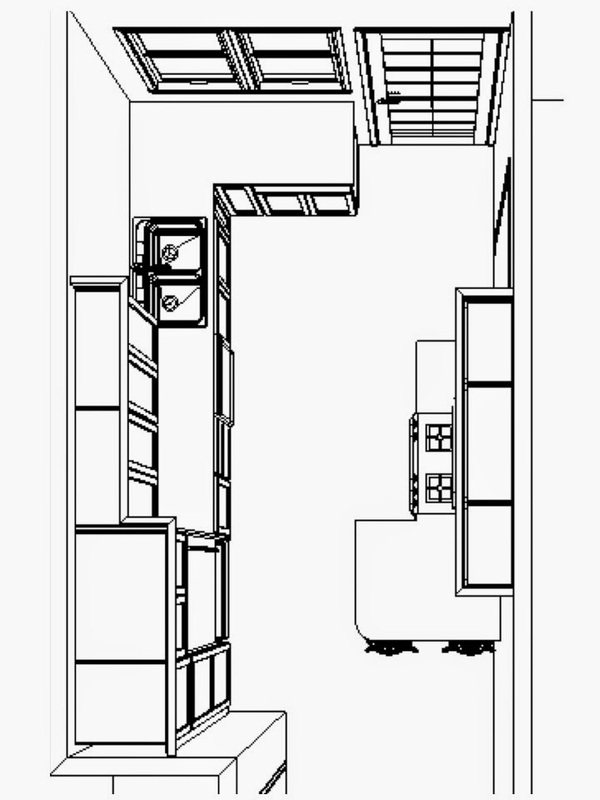 This kitchen had the exact same (but mirror opposite) floor plan as the Owner's Unit. 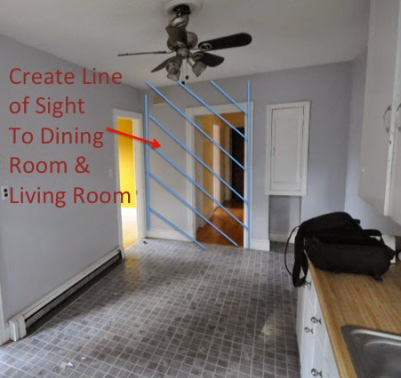 Yet the design on this side was changed up a bit by opening up the hallway from the dining room and creating a flow between the spaces. 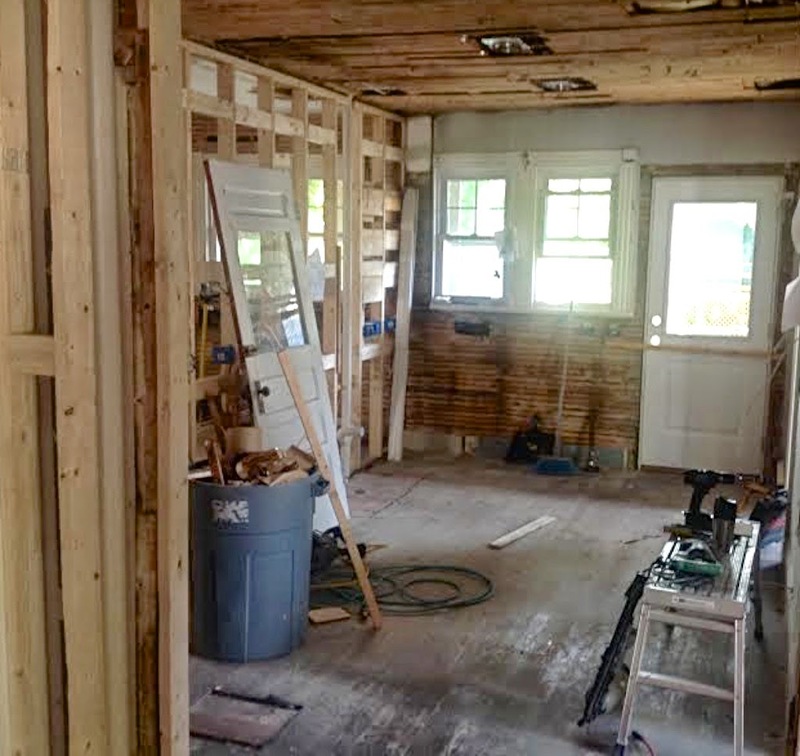 We also closed off one of the doorways leading off of the kitchen (to create a large 1st floor bedroom). Kitchen - after the gut job! And like the other unit, we did an extensive amount of work. All new electrical, plumbing, walls and more. And we also found the same beautiful antique red birch flooring under those old vinyl stick on tiles! 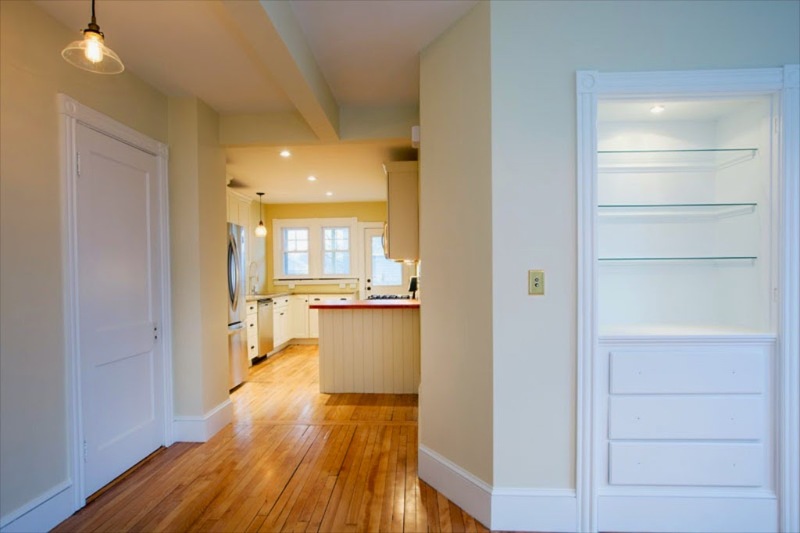 By removing this built in cupboard and moving the china cabinet in the dining room, we were able to eliminate the old, dark hallway and make this space bright and open! And look what a fantastic job the guys did of repairing the antique floors, after we removed all those walls! Hallway After - nice and open with plenty of light shining through! It's always so much fun to see a plan turn into reality! 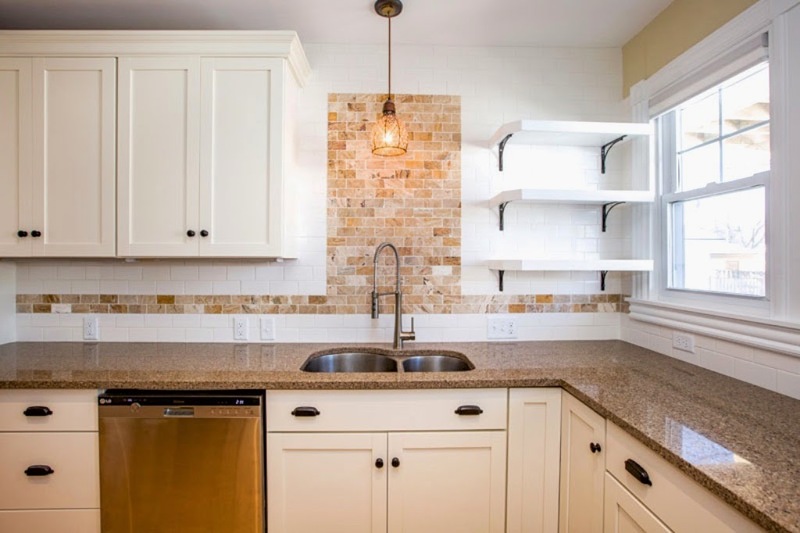 This kitchen has a lot of storage. 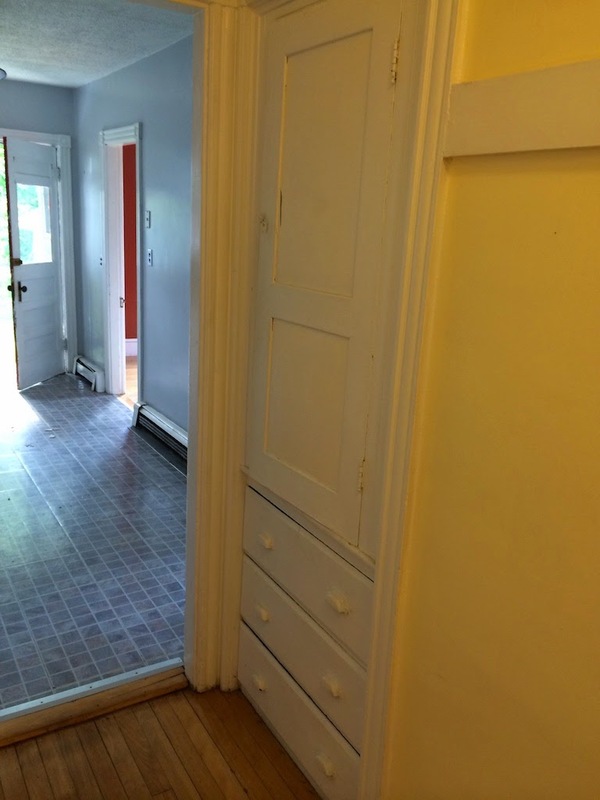 There is a large, full depth pantry next to the refrigerator. 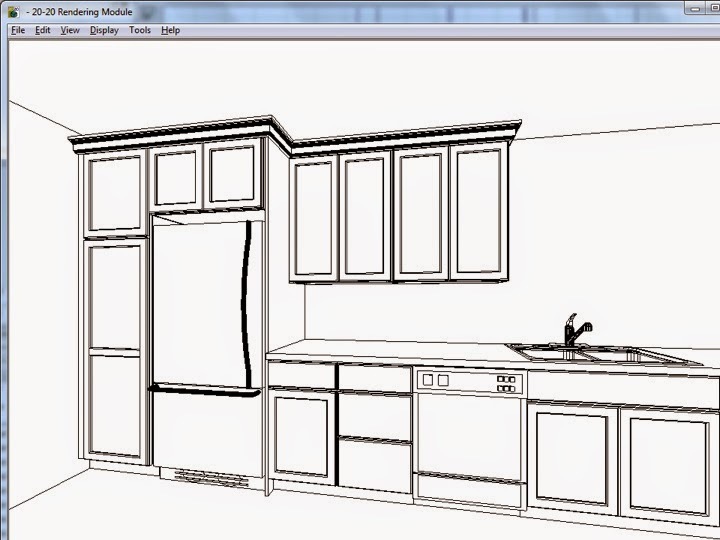 Combine that with all the other cabinetry and you can store lots of pots, pans, food and more. 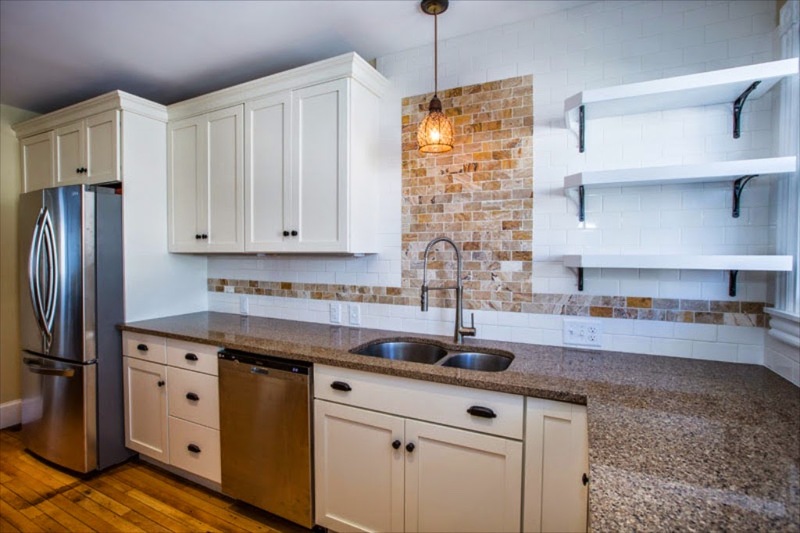 For the cabinetry, we used Martha Stewart's Heavy Cream Purestyle cabinets and added quartz countertops, open shelving and a pretty cool pendant light over the sink. 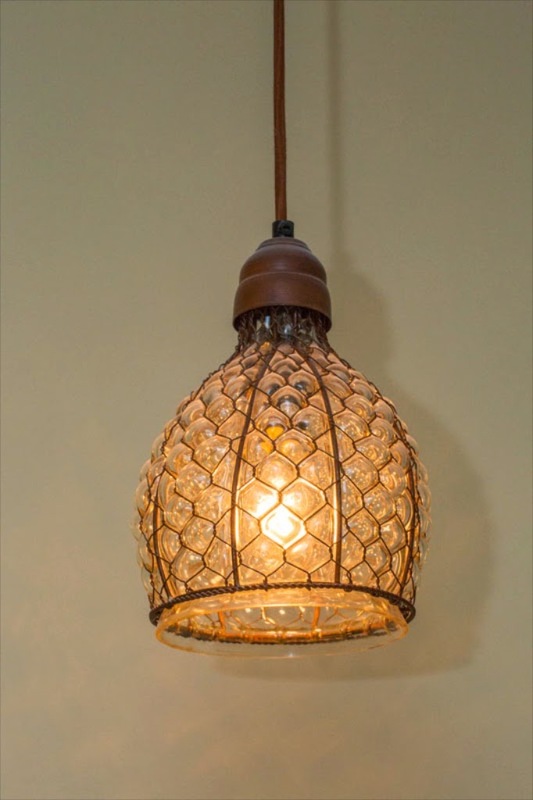 The glass is blown through the chicken wire and the resulting angles of the glass give it a beautiful glow when it's on. 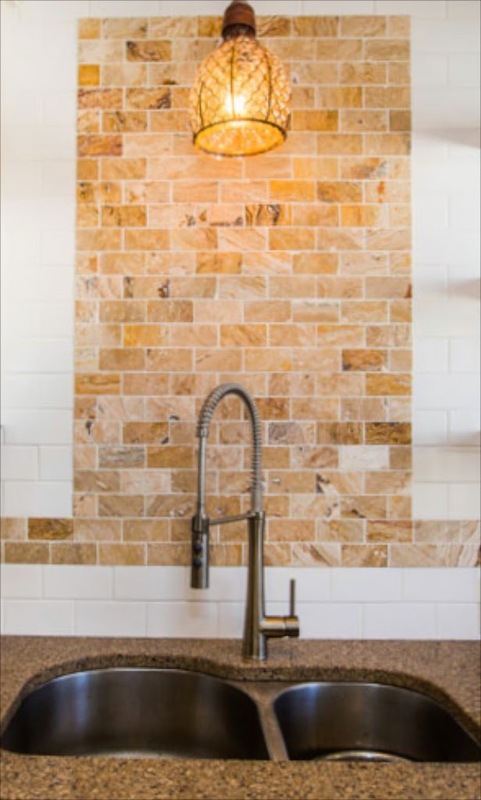 We wanted to add a little more visual interest on the backsplash. So we used a marble inset tile to set off the white subway background. 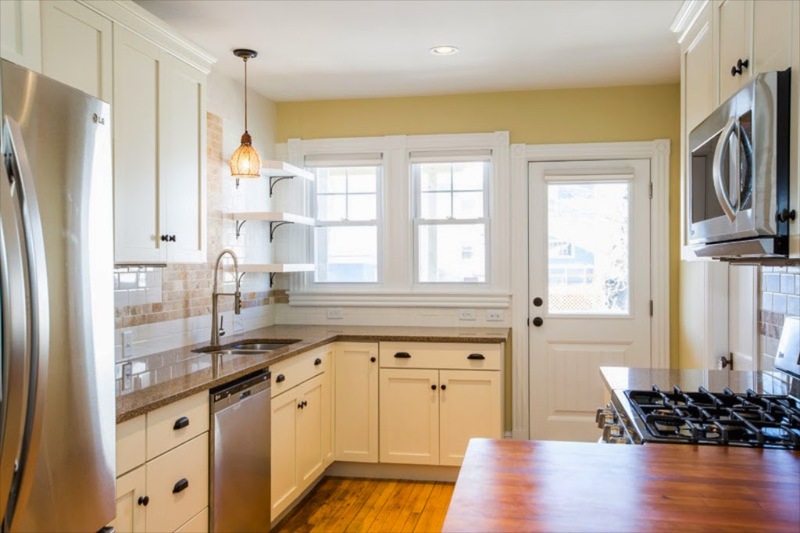 And the creamy golden marble colors coordinate with the quartz countertops and cabinets. 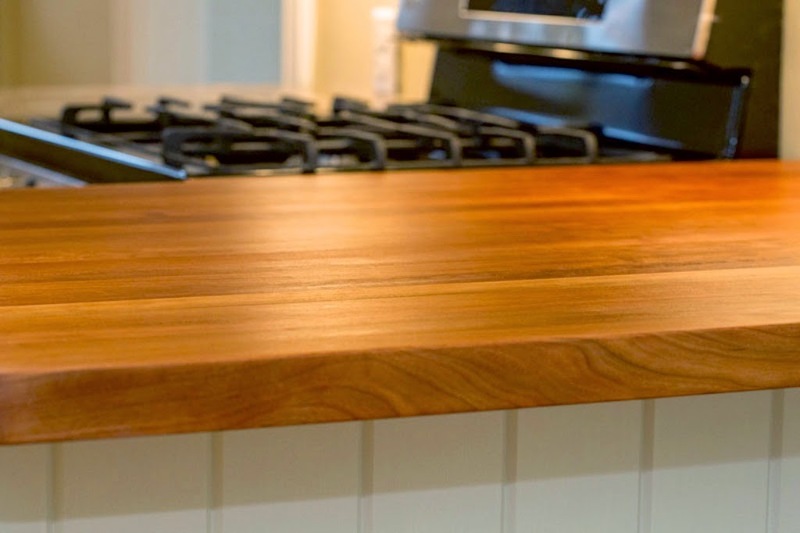 And we added this beautiful cherry butcher block top on the peninsula. I like to mix wood with a solid surface whenever I can. It adds a warmth to the room - you can't help but run your hands over the wood surface! And it's the perfect place to put a couple of stools to chat with the cook! We're so pleased with the 'After' kitchen and our tenants love it too! 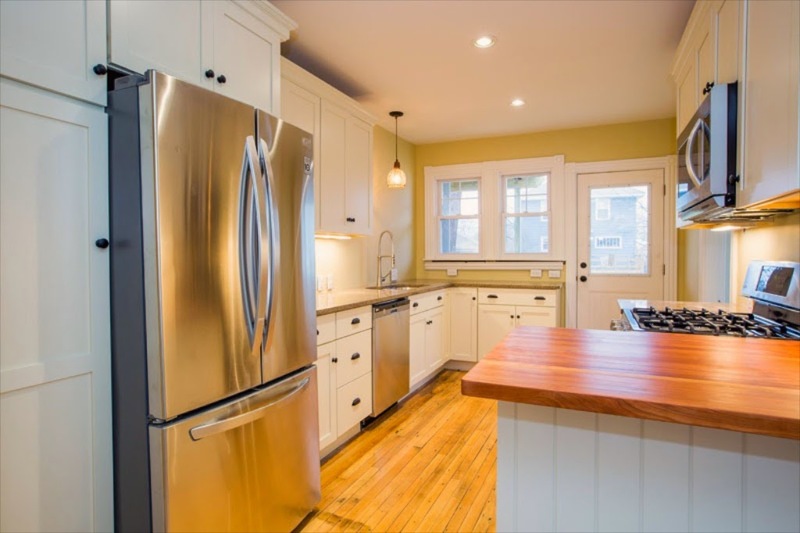 Curious to see how the Owner's Kitchen came out? Click here. I'd love to hear which one you like the best!! Love them both but the tenants kitchen makes my heart sing! It feels cozier to me and I love the cherry counter and that yummy pendant. Another great job! Can't wait to see what's next. 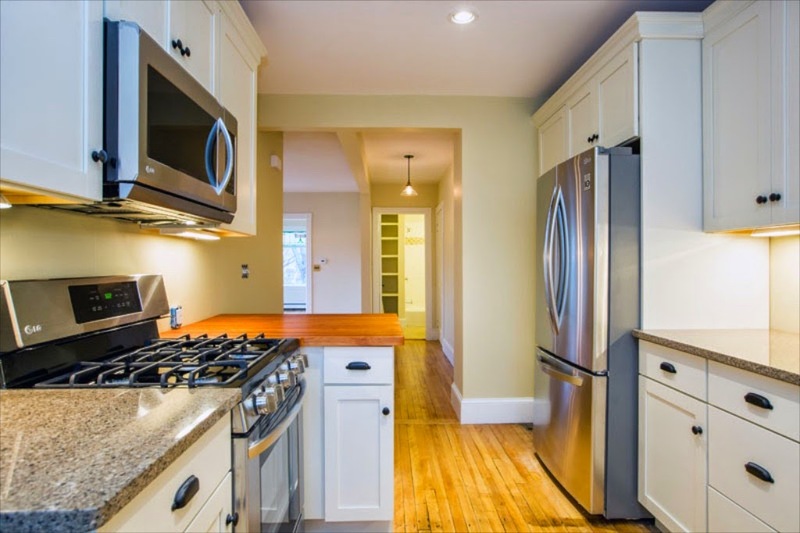 I was talking with our tenant's this weekend and they just love the kitchen - and that's the word they used - 'cozier'! 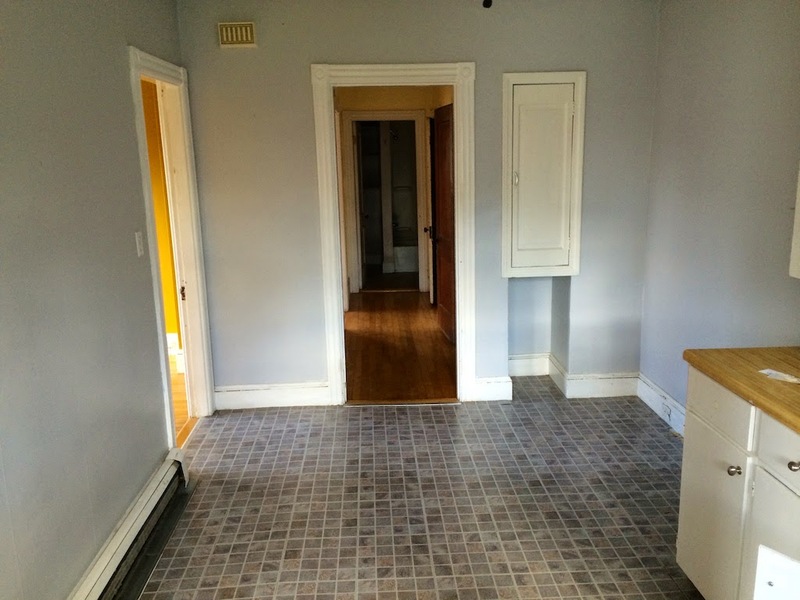 With the new layout, they've already been able to have a dinner party for 12 people. That could never have happened in the old space! I love the marble tiles and the pendant lamp. What lucky renters you have! Thanks so much! I know plain white subway is very popular - but I couldn't resist adding a little splash with that gorgeous marble! Thanks Sarah. This was a really long project - but we're so happy with how it came out! Very Nice! When is number 8 happening?